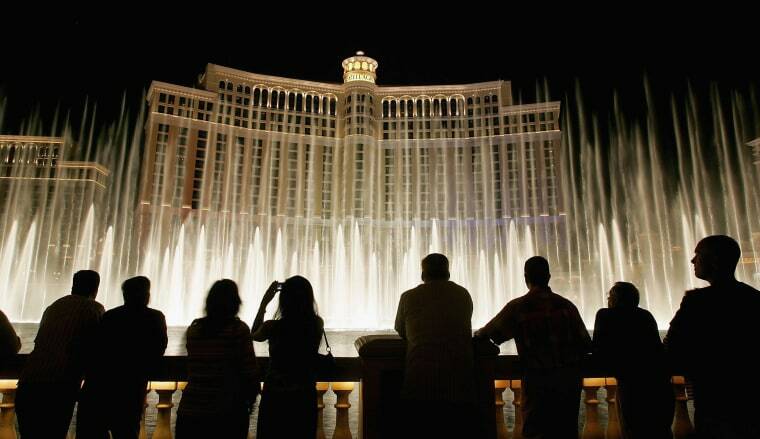 LAS VEGAS — The fountains at the Bellagio Resort and Casino resumed Tuesday and many Las Vegas shows were back on, a day after the attractions were closed out of respect for the victims of Sunday's mass shooting that left 58 people dead. Jennifer Forkish, vice president of corporate communications at Caesars Entertainment — which owns the Palace, the LINQ and Paris Las Vegas, among others — said that cancellation fees were being waived for guests wanting to change their trips "but none of our cancellations appear to be out of the norm." Jennifer Lopez performances planned for Wednesday, Friday and Saturday at Planet Hollywood were postponed out of respect for the victims. Frank Marino of "Divas Las Vegas," which reopened Tuesday, told NBC News that getting back to the business of entertainment is a symbol of resilience similar to Broadway reopening after the Sept. 11 terrorist attacks. "It's all about not letting a terrible situation win," Marino said. MGM Resorts canceled all Las Vegas shows on Monday out of respect for the victims but on Tuesday all performances were back on schedule except for "Michael Jackson One," which is at Mandalay Bay, the hotel where gunman Stephen Paddock opened fire from the 32nd floor before apparently killing himself. Caroline Peacock, 38, visiting from England, had planned to see the Michael Jackson show, but she said the setback was of little importance considering the tragedy. "We can't be upset about it," she said. MGM Resorts would not say whether business had been affected by the shooting. The company said Tuesday it would donate $3 million in humanitarian assistance to victims and first responders support organizations through its foundation. By Tuesday night part of a stretch of Las Vegas Boulevard which had been restricted after the shooting was reopened. Signs on the Las Vegas Strip advertising excursions to shoot machine guns had been replaced with automobile ads. But as attractions began resuming, some visitors said they were feeling extra vigilant and sensitive to loud noises. A pair visiting from Germany recalled the panic that surrounded the night of the shooting, when there were rumors that multiple gunmen were targeting casinos on the Strip. Shirin Wagner, 30, and Marco Hau, 26, just finished dinner at Caesar's Palace Sunday night, far up the Strip from Mandalay Bay, when a group of young women ran inside "screaming there was a man shooting." "It was panicking and chaos," Wagner said. Paddock was the lone shooter, authorities said. But frightened people ran towards the emergency exits amid the chaos, and Wagner said they thought there was a gunman inside the casino. Wagner and Hau couldn't get back to their hotel and had to book another room. They said they did not intend to change any vacation plans. "We are nowhere safer than here because of the police," Hau said.